Washington, DC - When people take a moment to report fraud, identity theft, or questionable business practices to the FTC, they’re giving consumers everywhere a “gift” of sorts. We use those reports – we get millions every year – to warn others about the latest scams. They also serve as an important source of information for our law enforcement efforts. The FTC just announced a new development that makes those reports even more valuable. Until now, we have released aggregated consumer complaint data once a year through our Consumer Sentinel Network. But that changes today. Now we’ll be making that information more usable by releasing it quarterly in an interactive online format. The new tool will offer a more up-to-date picture of what consumers are telling us. Looking for a timely snapshot of what’s going on? The system now empowers you to get that information. But if you’re digging for details, you can search by types of fraud, by state, and by a number of other variables. As part of this project, we’re releasing our first Consumer Protection Data Spotlight – a new kind of publication that uses the data to illuminate important stories we’re hearing from consumers. Today’s Data Spotlight focuses on a disturbing trend: scammers’ growing preference for payment by gift cards, particularly iTunes and Google Play cards. 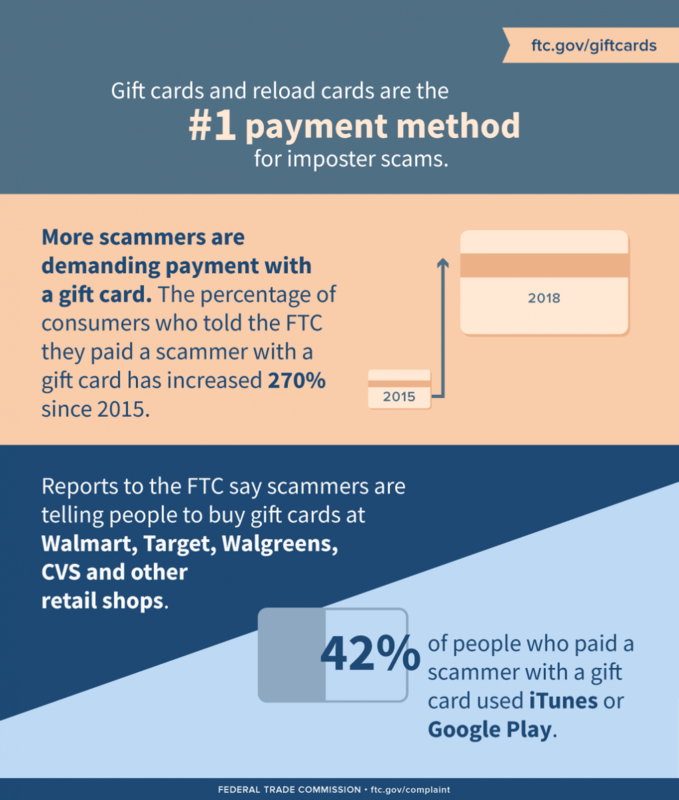 The percentage of consumers who told the FTC they paid a scammer with a gift card like Google Play or iTunes or with reload cards like MoneyPak has increased 270% since 2015. Gift and reload cards are now the #1 reported method of payment for imposter scams, in which criminals impersonate a government official, a tech support representative, a utility company, or a loved one in trouble (“Grandpa, I’m in the hospital overseas and need help now!”). Their methods morph, but they have one thing in common: They all want money. And as reports from consumers demonstrate, in increasing numbers, they want it in the form of gift cards. Why gift cards? They’re attractive to scammers for two reasons. First, gift cards allow them to remain anonymous. Second, once the consumer gives the scammer the number on the back of the card, the scammer can access the money, and it’s difficult to reverse the transaction. The FTC’s advice to consumers is simple: If someone tells you to pay with a gift card, don’t. Gift cards are for gifts, not for payments. The Data Spotlight also offers insights for businesses – both gift card issuers and retailers. Scammers’ insistence on payment by gift card is not a once-in-a-blue-moon phenomenon. It’s a growing threat happening every single day across the country, causing devastating losses to consumers. In other words, the data point to the conclusion that gift cards have become a payment method of choice for crooks and con artists. That doesn’t just harm the thousands of people who report the fraud to the FTC. It can tarnish a brand, too. No one should want to be the financial favorite of the scam set, which is why looking the other way just isn’t an option. Warn your customers about fraud, and give them a phone number they can call to report it to you.